Online brokerage firms have penetrated 70% of the addressable retail trading opportunity in Japan. Boston, October 22, 2014 – The number of Japanese retail traders has surpassed 16 million, but only 23% of Japanese traders are under 35 years of age. Alarm bells are ringing at Japanese online brokers because transaction activity may decline sharply as older traders retire. Can a trading activity crisis be averted if more Generation Yers enter the online trading market and existing traders begin to trade more frequently? 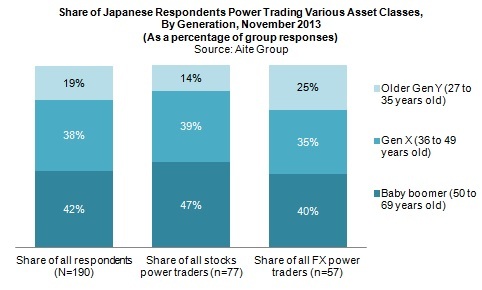 Based on two online quantitative Japanese surveys that Aite Group fielded in November 2013, this Aite Group Impact Report provides a comprehensive look at the demographics, lifestyles, and trading characteristics of Japanese online traders as well as their latest trading technology usage and requirements. This 37-page Impact Report contains 33 figures. Clients of Aite Group's Wealth Management service can download this report.